You are currently browsing the tag archive for the ‘rice cooker’ tag. Invest in a good rice cooker, even if you’re not Asian. Having a quality rice cooker is like having a gym buddy who always wants to work out. Making quinoa and brown rice will become so easy that you’ll stay super motivated to eat healthy, with an intensity greater than Lou Ferrigno’s desire to beat Ahhnold. Aside from making rice with a touch of a button, my rice cooker also keeps me from cheating on my diet by having my meals organized in advance. It’s like my personal health assistant. And a rather fiiine one at that. By having a surplus of warm rice on hand, I always stay one step ahead of my next meal. Oh, and it also happens to sing “Twinkle, Twinkle, Little Star” whenever as it starts cooking for me. That Zojirushi… she’s a keeper. Whenever I make brown rice or quinoa for dinner, I always make sure to cook an extra ½ cup – 1 cup. With this rice reserve, I never suffer from that Starvation Scramble anymore. You know, when you’re so hungry that you resort to trying the strangest combination of foods in your fridge just to silence that gurgling in your stomach? Tortilla chips dipped in Wasabi Mayo? Tried that. Having to wait an hour to cook rice when you’re starving is almost as painful as watching a clogged Brita slowly trickle water when you’re hungover and dying of thirst. 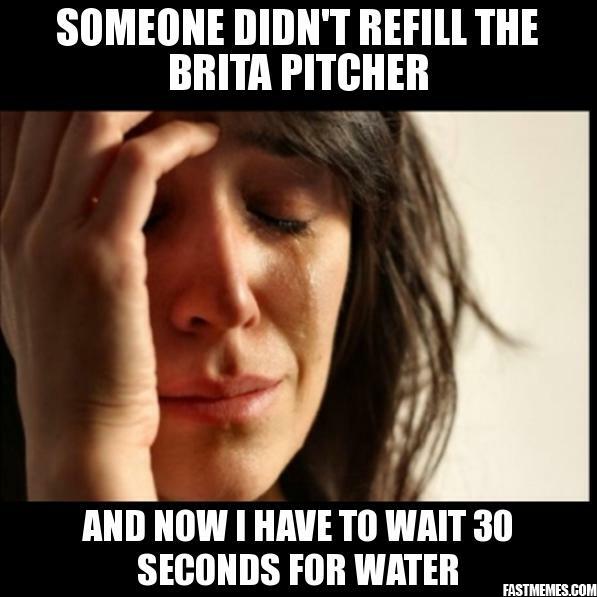 It’s the worst when you fill up the Brita, leave for a good 5 minutes, only to come back to a nearly full loading tank. Then out of desperation you decide to pour yourself a glass anyways, and of course the lid pops off, exploding water all over your counter and leaving your glass half empty. Fail.